-Skin in all pics is available free in the Kalista base skin pack at Tuli mainstore. -Both kirtles, hello kitty and sponge bob (snoopy not shown), were won in the lucky chair at E-Design and made me laugh for the hour I waited to win all three. Hair: Free "Sayuri 2 blueberry" Subscribe to Waffles! and check history. Hair: Free "Teased Up Resturant Ketchup" group gift from Lamb. Hair: Free "River B white ash" available at Glitter. Hair: Free "Jess mocha" fat pack all colors available at Truth. Hunter's Cove (Hunter IV) is a group of several different vendors and stores, many of which have a prize camping system. Flames of Passion has two prize campers where you can sit for a period of time and earn items such as a bath camisk, couples pose balls, a water pitcher to be worn on the head and even a Tuchuk Tospit Wager game. I camped for 10 minutes to get this camisk. note - the belt pouch is scripted to give you a rep cloth when you click it. 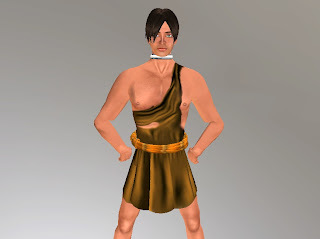 Another prize camper that contains a Warrior’s outfit, a FW Gown, and several different slave chores is repeated at several different locations around the Sim. I camped for 15 minutes to get this wool carding chore. Chore: 15 min camping "Slave Chore Carding Verr Wool" at The Great Serve. While there, the lucky chair came up with G. This weeks prize is a Master's chair complete with a two person pose, although you have to use your imagination for the second pose. Chair: Free "Master's Comfort" available in Lucky Chair at The Great Serve. The skin worn in all these is another from Free Speerit, available on the "pay what you want" wall so the price is up to you. The skin has tears and may not for every day use but a good novelty item. Skin: pay what you want "Kimberly (Bleeding Mascara)" available at Free Speerit. This month the Lucky Chair at Analise features this men's tunic. Paired with a collar found during the Gorean Grid Wide Hunt at store #47 Secrets of Gaia it could work as a Kajirus look for those looking for an alternative to male silks. Outfit: Free "Lucky May Tunic" available in the Lucky Chair at Analise. Collar: Free "SG Walk the Line Steel Collar (Unscripted)" available at Secrets of Gaia. Skin: Free "ARSNOVA DANIEL Skin B01" available at KMADD free gift wall. The Gorean Grid Wide Hunt has started, see the official blog for more details on participating stores and updates. The starting point is here. -Find a Heart in participating stores, many provided hints which made it fun. -Buy the Heart for 0L, some of them you might have to click. -In addition to the gift you will receive an LM to the next location. -Note that gifts may be moved or rehidden by the store owners at any time. Here is a sample of what I've found so far. Passion has a low caste Free Woman’s dress and a camisk each for 1L. Passion is located on the upper level of the Laura market beside the teleporter. 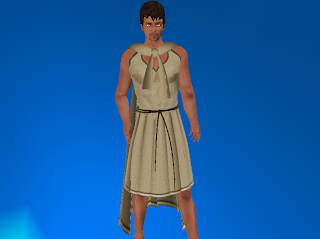 Outfit: 1L "FW Gown Gift" available at Passion. Outfit: 1L "Kajira's Camisk" available at Passion. The skin is the latest group gift from Rockberry called Uma, comes in 4 skin tones. Free Speerit released another new group gift today, a skin called Kimberly Tan Pop. Skin: Free “Kimberly Tan Pop” group gift from Free Speerit. Eyes: Free “Cape Shelley” available at Wild Lilies. Camisk: Free “Tibit Camisk in Tan” one of two available at Shifty Owl down the ramp. Hair: 5L “.::Forest::. Elv'an Hin Hair” available at Elv’an Majika where almost everything is just 5L. Thanks again to Persephone for the tip on the camisks. 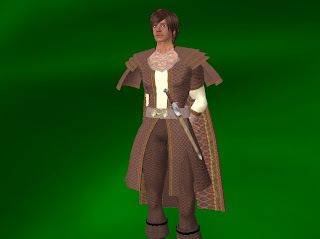 The Land of Freelinium has a few free and low cost medieval outfits. This one, available in brown and black, might be suitable for some Gorean roles. A better look at the skin and hair. A trip to Elements to see the limited release for May revealed a giant Lucky CupCake that you click to eat and take your chance to win one of several prizes so I had to try it. Lucky CupCake whispers: GoreanGoodies Shuffle wins an Elements - May - limited release. 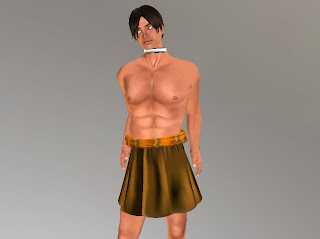 Also shown, the other 1L skin from the Tuli hunt and the hair is the black version of the Magika gift for subscribing, both locations linked in the previous post. First I should mention that Tuli is having a skin hunt at the Tropical store. You have to hover over and check the prices of each skin but it doesn’t take long to find the two that are priced at only 1L. This is one of them shown here with the “Vanish - Blonde B” hair that you can currently get for free just by joining the Magika subscriber system. Now on to the Kargash & Gorean Information Center. There is one building with several free and very affordable items for all types of roles. Here are just a few. Thank you Amra for the tip.